Where do I begin to describe Sri Lanka! After an airline experience that went from bad to worse to damn near deadly (emotionally), I was exhausted and ‘over it’ when I arrived in Colombo before the sun last Saturday morning. I spent my first night in Negembo, only thanks to it’s proximity to the airport and my lack of motivation to travel further. Negembo is a busy, bustling fishing town with a strong Christian influence thanks to Portuguese rule several decades (centuries?) ago. It was a good first stop, but I didn’t need more than 24 hours. 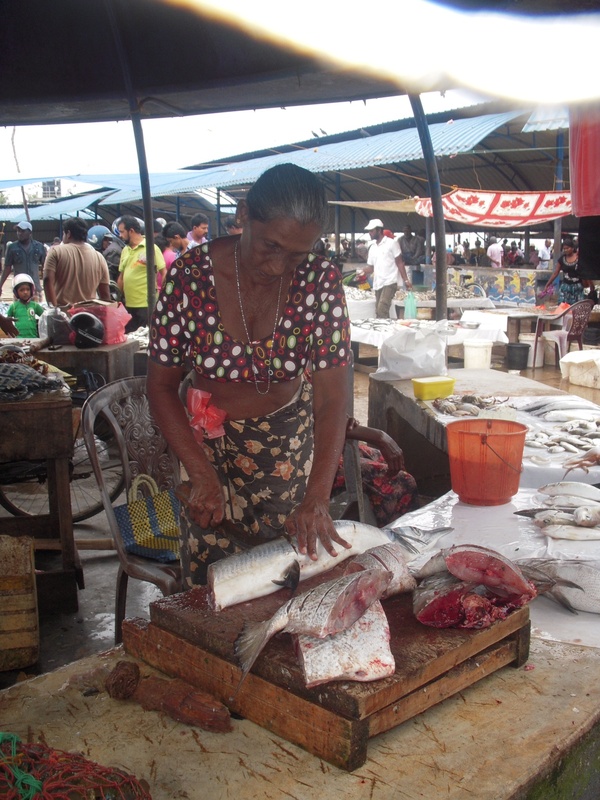 A quick tour of the smelly but very fascinating fish market and a wander around town and I was ready to move on. My next stop was Colombo, just an hour or so by bus. On arriving in Colombo I then paid 4x my bus fare to take a taxi to my hotel. Hmmm. Colombo is a bigger, more developed city that I had imagined. There is a solid infrastructure and many modern luxuries. Much different than Nepal. The roads were paved, businesses were bigger, people had more money, etc. Honestly, though I probably could have done without a stop in Colombo. It was especially difficult as a single white female. I was endlessly the target of schemers and salesmen and tuktuk drivers. As well as endured frequent unsolicited and quite obnoxious comments from both young and old Sri Lankan men who were missing their manners. Anyway, on day 3 I caught a train to the coastal town of Hikkaduwa. 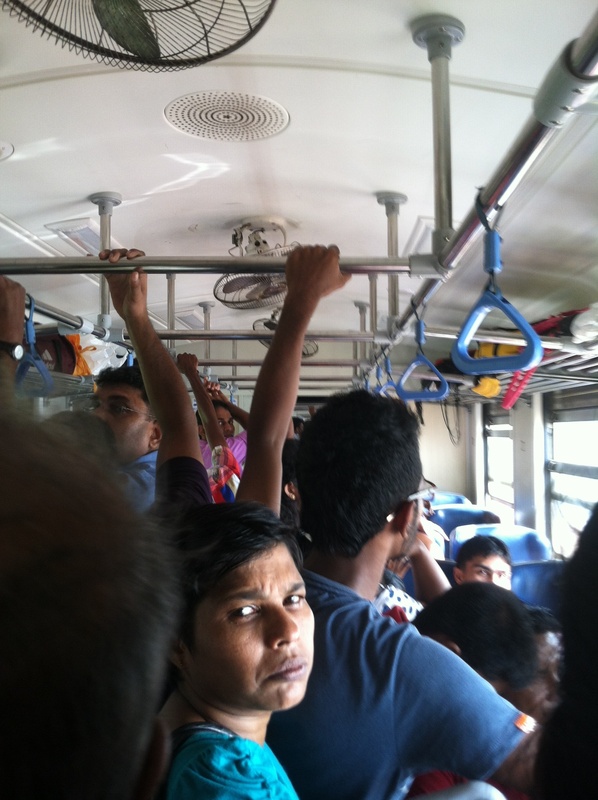 My 130 rupees ($1) ticket did not buy me a seat on the train, just the opportunity to fight for a place to breathe. I had heard the train could take anywhere from 2-6 hours and given my cramped 6 inches of standing space between an overweight German man and a Sri Lankan family of 5, I was desperately hoping for the former. Fortunately we pulled into my stop just a short hour and forty five minutes later, which was a really good thing because I was afraid my knees would be permenantly locked if I didn’t stretch them soon. I arrived at my adorable little seaside hotel, where my cheapo room was in the midst of a pre-season renovation. Well lucky for me, they had plenty of ‘King rooms’ with balconies available. Score! I did some exploring and called it an early night. The next morning I got up for Yoga, with Lindon, Hikkaduwa’s famed ‘rubber man’. He is a happy, eccentric, yogic expat that has been living in Sri Lanka for 15 years. He taught a really grueling but energizing ashtanga style class. It was exactly the kind of grounding experience I was looking for after having a rocky start to my Sri Lankan adventure. After class, I met Casey (Australian native who has spent the last decade of his life running back and forth across the world between the sand and the snow) and Helena (Norwegian in the midst of a quarter life crisis who has just sold out her share of a restaurant to globe trot for the next year). They are both on their own in Sri Lanka and I instantly loved them. We went for a coffee and then connected with some dutch girls to go for a surf. Even though I was very honest about lack of experience, I was still invited along with this much more seasoned crew. People are so nice! We caught a tuktuk to Galle, where the waves were rumored to be a little more mellow and more manageable than in Hikkwaduwa. I liked the sound of this. We spent about 2 hours on our boards (or under, across, over, and everywhere else in my case). It was more work and more fun than I ever imagined! What have I been missing my whole life! On the way home we stopped at a Dutch fort and took the scenic route to explore some less touristy areas of the coast. It was a perfect day. I was so exhausted I could barely think, but so blissfully happy. Yesterday was more yoga. The waves were rough though so much to my disappointment Helena and I spent the day just hanging on the beach. It was so hard to sit and watch the waves when you just want to be in them! Finally around 4:30, I had had enough of sitting around and waiting so I confidently approached some beach boys for a board rental. At first I think I had them convinced I could handle it, but after being unable to tell them my board size (what?) I had blown it. They took one look at the water and back at me and suggested I sit back down for the evening. Oh well it was worth a try! This morning, yoga again! Such a good start to the day. After breakfast, the dutch girls were going to explore some Sri Lankan culture and Helena was joining them. It sounded nice I thought, but what I really want is the waves! I asked Casey to check out the beach for me and see if he felt like I could live through the morning. In the end, he and I decided to go back to Galle. It might have had something to do with him not wanting to feel responsible for me in the monsoon that is Hikkaduwa. Either way, I’m happy. 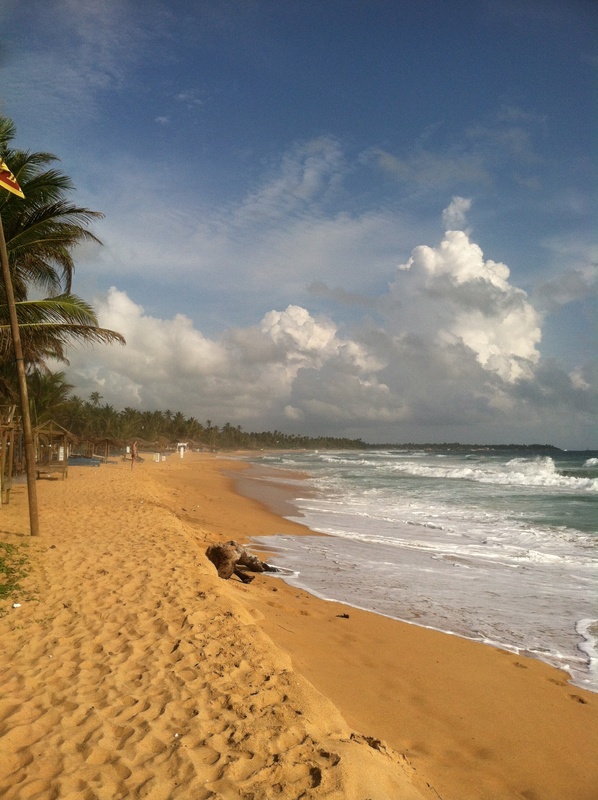 When we get to Galle my body hurts before I even get on the board. Uh oh. This day is not as much fun as my first and again I spent more time underwater than over it. But I do manage to catch a few waves that are bigger than last time, so all in all it’s a success. And I still have all my teeth and haven’t given myself a black eye. This is exactly the kind of zen I needed after seven crazy weeks in Nepal. Life is good. 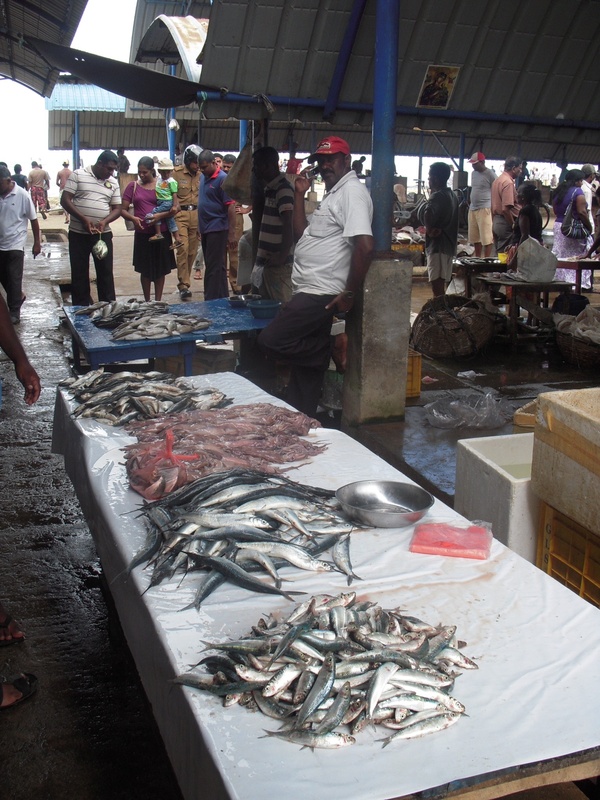 Fish for sale in Negembo! The variable thoughts of a young woman learning to mourn the death of the baby she never got to meet while recovering from the grief of saying goodbye to her mother.